Excellent product - what you see is what you get !!! Excellent product & seller - what you see on the website - is exactly what arrives. Would 100% recommend Trendhim to all. 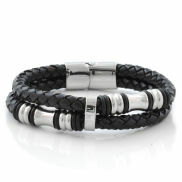 All of our steel bracelets are of the highest quality and mostly made from 316L surgical stainless steel. By clicking on any image below, you can discover the different models, colours and sizes available. On this page you will find our bracelets either entirely made of steel or a combination of steel with steel locking mechanisms. These bracelets are often called anchor bracelets because their links resemble the chain of an anchor. The vast majority of our steel bracelets are made of stainless steel, not silver, and there is a good reason for that. Stainless steel gives the bracelet a beautiful reflective surface just like real silver, but at a much more reasonable cost to you. Also, it is very difficult to tell the difference between silver and steel, especially when used to make a bracelet. Do you want to engrave your steel bracelet, thinking how perfect a personalized inscription would make it? Unfortunately, Trendhim does not provide an engraving service, it is not what we do! But your local jeweller would be very pleased to do it for you. The price of engraving can vary sharply from place to place, so it is best to shop around different jewellery stores. Are you hunting for a real gold bracelet? Unfortunately we at Trendhim only offer gold coloured bracelets made of stainless steel. All of our gold coloured bracelets are made from 316L surgical steel which not only look like gold but the stainless steel will keep its gold colour for as long as you take care of it. Stainless steel is very resilient, but if scratched deeply enough, the steel colour may be exposed. All metals can in principle lead to allergic reactions, often due to the nickel content. At Trendhim we are very focused on customer satisfaction, so that all of our steel products, including our bracelets are tested to be certain that they are nickel-free and safe to wear next to your skin. 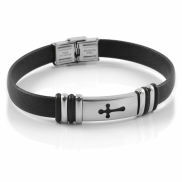 What size steel bracelet should I buy? 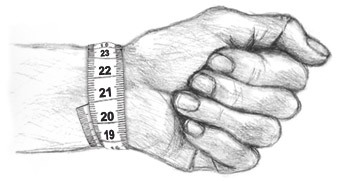 Below you can see how to measure your wrist so you can get a bracelet that fits. The tape should not be too tight and then you add 0.8 inches to the circumference. As show above, the wrist measures at 21cm +the 2cm allowance, so the bracelet should therefore be 23cm. If the bracelet to be a gift, or it is just not possible to measure the wrist, follow these guidelines. You can filter by bracelet size at the top of this category.